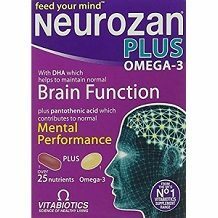 Our review in this article is focusing on of a product made by Vitabiotics called Neurozan Plus Omega-3. 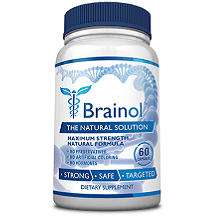 The product was made to contribute to the maintenance of normal brain function. The makers claim that this product should provide advanced nutritional support, as well as provide nutrients that help contribute to the maintenance of the normal brain and cognitive function. The nutrients and vitamins used in the product are important for regulating mood, preventing mental fatigue, enhancing metabolism, brain and liver function. The inactive ingredients manufacturer used in the product are Glycerin, Stearic Acid and Magnesium Stearate. Neurozan Plus is not suitable for vegetarians as it contains fish oil in a gelatin capsule. Take one capsule per per day with water and the main meal. The dosage instructions do not specify if there is a preferred time of day to take the capsule. Do not chew the tablet or exceed the recommended dosage. Speak to a health professional before using this supplement. You can purchase this product directly from the manufacturer’s website. Each bottle contains 56 capsules and costs $24. At one capsule per day this is enough to last you just under 2 months. If you subscribe to a recurring order you get 20% off the purchase price. The manufacturer did not include any additional special incentives for new customers nor discounts for bulk buyers. Since the product is shipped from the UK, the cost of shipping elsewhere will add considerably to the price of the product. Shipping is free within the UK. We did not find a money back guarantee. We were encourage by several features of this brain booster supplement. The product contains a good selection of nutrients and vitamins including Ginkgo Biloba Extract, L-Arginine, and Glutamine that may provide advanced nutritional support, as well as provide nutrients that help contribute to the maintenance of the normal brain and cognitive function. The price is reasonable at around $24 for an almost 2 month’s supply of capsules. There is free shipping within the U.K. There is a 20 % discount if you subscribe to a recurring order. The product is flawed in several key areas however. Since the product contains gelatin, it is not suitable for vegetarians and vegans. The manufacturer did not offer additional new customer incentives or bulk purchase discounts. Since the product is shipped from the UK, the cost of shipping elsewhere will add considerably to the price of the product. There is no guarantee or return policy offered by the manufacturer. Dosage instructions are a bit vague. The manufacturer did not specify if there is a preferred time of day for taking the capsules. There is no assurance that the product is made an FDA certified facility, that its ingredients are non GMO, or that it is free from fillers and binders. For all these reasons we are not recommending this supplement as a brain booster. Look for one with a reliable guarantee, better bulk buying discounts, and cheaper shipping options.